Momentum is a fun thing. Since the Aurora Win, I’ve seemed to have drawn a lot more attention. The following has been kind of how my schedule has gone the last couple of weeks. I’ve not said everything in here mind you, but enough to give you a sense of how surreal things can get. Wake up and Interview Spider Robinson. Awesome interview and time. Spider is a sweet man enjoying his life, and I can’t wait to share this interview when it’s out. Got approached from a friend in high school I hadn’t heard from in a long time. Cool to catch up. Woke up to busiest podcast activity ever. Got feedback from a friend for my next book (more on that next blog). Came awake to request to be interviewed. Got memed. Still have nightmares about the one with my face on a banana. Asked to do a quote for a book signing and talk to an author dealing with some of their own personal struggles. Never been approached like that before. Released new column and new podcast. Asked a few people to be column three and got a taker. Woot. Beyond that, got requested to do an interview for next week. Scheduled another interview and did some revising on next book. Had a day off. Woot. Podcast broke 400 plays/downloads in a week. Crazy how things grow. Interviewed probably one of the most respected publishers as a person. He was beyond class and we sat down and chatted a bit about his life story. Awesome dude. Attended friend’s concert performance and wanted my opinion. Was a lot of fun to see him in action again and we talked some stuff over. Scored a potential podcast interview in the future. Did another interview with a good friend of mine. His episode will air sooner than later. Another interview request. Also, finally got back to write club and catch up. Wanted to thank some of them personally for my success. There was a lot more that happened, but I thought that this would be a neat look at what’s been going on with me the last few weeks. This isn’t a brag so much as a change. Momentum really starts rolling for you. It never stops. I’ve been trying to work a little earlier for the day job. I honestly couldn’t do it. Things were taking my attention more and more with the podcast and the writing stuff that I was happy. It’s one thing to work and work and work at things. It’s another to see things moving and fires burning. I’m really stoked that this is the way things are going. I’m going back to When Words Collide here. Saturday night I had a chance to talk to Jonas Saul. For all Jonas has done, he told me that he still felt like he hadn’t accomplished anything. There is something to that thinking. You have to always approach things as if you’re starting from the very beginning. Even though this has been an amazing year for me, I feel like there is still a lot to do. I’m always a work in progress. Still, it’s neat to see momentum and things moving. I hope if you’re reading this, you’ve experienced something like this too. The other thing? I got to talk to a comic book legend in JM Dematteis. Been a big fan of his since his Silver Surfer run and have read a lot of his material since. The episode is here. I also read a bit of The Cloud Diver at the end of episode. Cool right? On to the blog. There is no guaranteed path to success. I’m not saying that this will insure that you will always achieve your desired outcome. Success and failure have no assurances. I have a friend who has this cynical view of dreams coming true. “You can be anything you want to be,” he says in that sarcastic tone. There’s a tinge of sadness every time he says this. A friend of mine I haven’t talked with for a long, long time finished the thought. It’s a very unspoken part of the sentence. Not many people say it, but a lot of people believe it. That’s the problem. I don’t know about you but that images pisses me off. But we all feel this way sometimes. Not good enough for that girl, that job, that career, whatever. We beat ourselves most of the time when we think like that. Our minds are powerful. If we tell ourselves we can’t do something, we can’t do it. With very few exceptions. Thing is, can’t do it is in our heads a lot. One of the most important lessons of my life involved my dad. At eight years old, he took me to Fanshawe Park. There we walked along the stream and then, for whatever reason, decided to scale the hill. I was eight and little and small and looked at this hill with dread. To be honest, I didn’t want to do it. Dad scaled the thing with ease, which meant I had to try. The first time, I fell…well, more like skidded down the hill. I really didn’t want to climb the thing again. Dad encouraged me. I on the other hand, discouraged myself. “I can’t do it.” I said to myself. I kept climbing, saying that mantra over and over again. To my surprise, somehow I found myself on the top of the hill. This is one of my most important lessons. Can’t is a concept. Worth is a concept. Deserving is also a concept. Life is inherently unfair and that isn’t exactly a bad thing. But there are no guarantees. Success and failure are possible outcomes. That said, ninety percent of all your battles are just one thing, and that’s this: If you want something and you want the best chance to succeed at getting it, show up and take action. It sounds simple. In essence that’s what you do when you go to work, that’s what you do when you go on a date, that’s what you do when you choose to do anything. Show up and do something. There are no guarantees after that, but really, that’s ninety percent of the work with anything. Don’t let those negative thoughts beat you. Just do the above paragraph. Show up and deal with the task in front of you. Every task in life is just those two things. You are big enough, brave enough, smart enough, and capable of doing anything if you just do those two things. Show up, and do the work. And don’t let any voice in your head tell you that you can’t do it. Don’t sabotage yourself. Because, why not you? but first: HOL-Y Crap. Drea Darc nearly set a record for most hits for me in a day. I want to thank everyone for checking it out and hopefully, voting for her in CBC’s Music Search contest. Okay, back to the present. When I published The Watcher months ago, there really was no master plan with the Watcher. I had a story come out of nowhere, and I had to tell it. Considering what cool things happened the first time I put together another book of poetry, and being older and wiser (or some such thing) that this book, compared to at least the last one, would be special and better. I think it has, but it’s still early. Anyways, two weeks ago I get a contract for it in the mail. As of a few days ago, I signed with Mirror World Publishing. Specifically, I’m signing up with them with the Watcher. I interviewed Justine Alley Dowsett about her book Mirror’s Hope, and it seems as though I made a good impression. More important; Murandy and Justine were a big help putting The Watcher together, and it seemed like a good fit. I’m really happy to have started somewhere and hopefully this will lead to bigger and better things for all of us. It’s a good lesson for me. You don’t always get immediate results with whatever you are doing at the time, but by doing things, doors open. This was another one of those unexpected doors and I can’t wait to see this in print and available for all to see. Really, the last thing I expected was that someone believed in me enough to give me a piece of paper that says they want to publish it. How cool is that? If that’s not exceeding expectations, I don’t know what is. There is more, (and not just the twitter hashtag #thereismore). As we speak I’m working on the second issue of something else I’m happy to announce here. I’ve been working on another comic series with the talented Twyla April for about a few months. We are about two weeks away from launching it on the site as the first issue is just about finished. I’m writing scripts as we speak, and Twyla is already demanding me to send her stuff. She’s so bossy. So what is the new comic series? It’s called Paradigm. 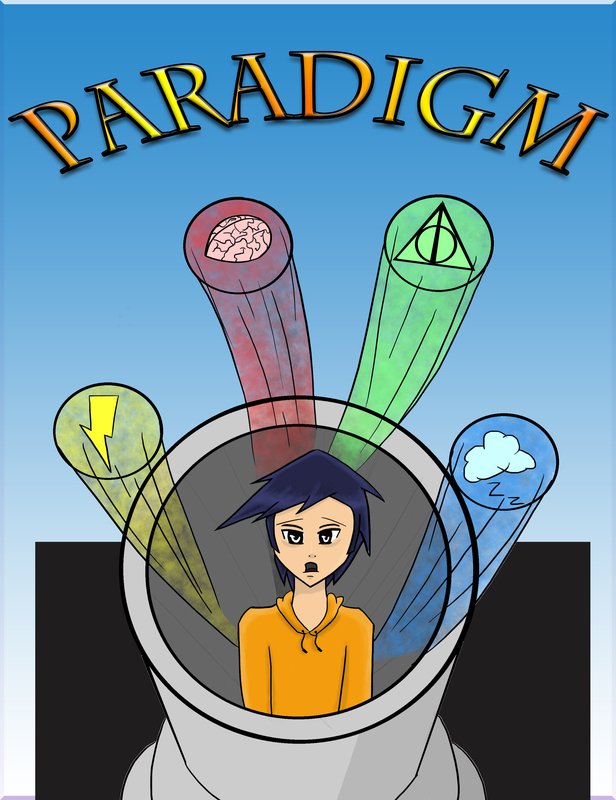 Paradigm is about a superpowered teen who uses his imagination to save the world from his parents. If it sounds very young adultish it’s because it is. Twyla has a very nice manga style and I wanted to do something fun with it. It’s been a pleasure to watch her grow as an artist and learn how to do a comic all over again. It’s difficult for a writer to do a comic, considering his/her limitations. I’m not sure if this is the greatest story I have ever told, but it’s one of the most fun. If you are a big fan of the disney afternoon, or grew up watching gnarly cartoons like Teenage Mutant Ninja Turtles, or just enjoy some zany fun, this will be for you. Pages will come out twice a week, and we’ll work our way towards a little graphic novel. Who knows where it’ll go from there? I really should show you a cover shouldn’t I? There you go. See that cover, and love it. At least, I hope you love it. More to come in a couple of weeks. Finally, this is convention season for me. I’m doing a lot of conventions this year, but this month I’m just doing two. In two weeks I do my first convention in Vancouver British Columbia. I will be part of Fan Expo April 18th-20th. Come visit if you are there. The week after I will be at Calgary Entertainment Expo, promoting both new projects. I’m going to take this moment to thank Murandy Damodred, Justine Alley Dowsett, Twyla April, Jim Reddington, and everyone else that’s helping me move forward in my dreams. I’m pretty excited. Lots of cool things going on, and while I have no clear idea where things are going at this moment, I’m proud of the things I’m doing where it all may lead. For tonight, that’s enough.